I’m a Crunchwrap, and I’m drenched in cashew queso, and I’m totally VEGAN. I’m loaded to obscenity with browned sofritas tofu, black beans, cashew queso, crispy tostada, tangy marinated cabbage, tomatoes, avocado, and I’m wrapped in a golden brown, perfectly crispy, handheld-friendly tortilla pocket. I am here to make you happy. But I’m also a blank canvas. You have some cauliflower walnut taco meat laying around? Roasted sweet potatoes? Chipotle cauliflower? I will wrap all of it up in a Crunchwrappy hug and you will not be sad at dinnertime. Above all else, SUPER RIDICULOUSLY DELICIOUS. So yes, this is a recipe, and I did include the instructions for some (VERY VERY EASY) sofritas tofu and cashew queso, because yummy. But more than a recipe, and more than its elements, the Crunchwrap is really just a method. A lifestyle, some might say. Magic Green Sauce in the fridge? Corn? Pico? Roasted vegetables? Fajita filling? Use it. Use it all. This is pretty much a universal, open-invite party. I fully endorse the sofritas / cashew queso combo (which is what I’m showing you here! ), but I’m not going to die on that hill for those who have their own filling ideas. 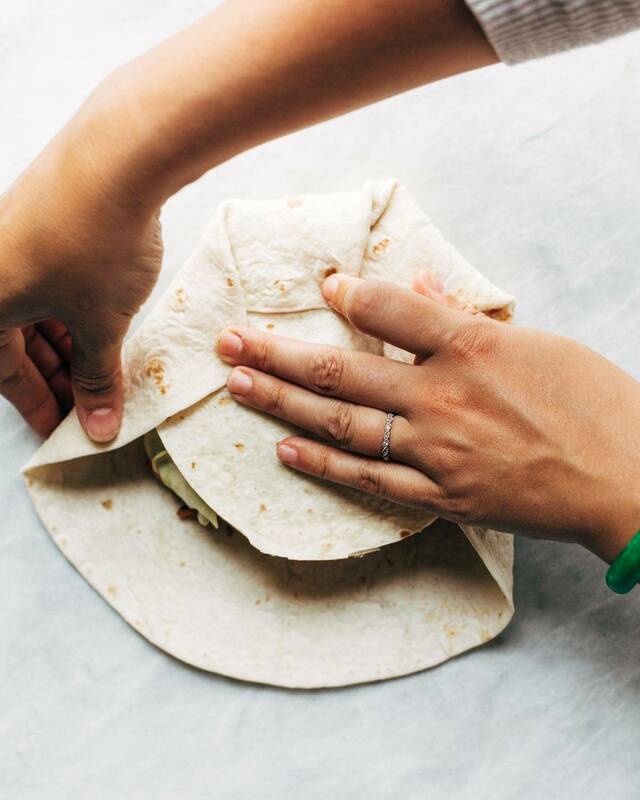 You do you – just follow the Crunchwrap method. Here we go. 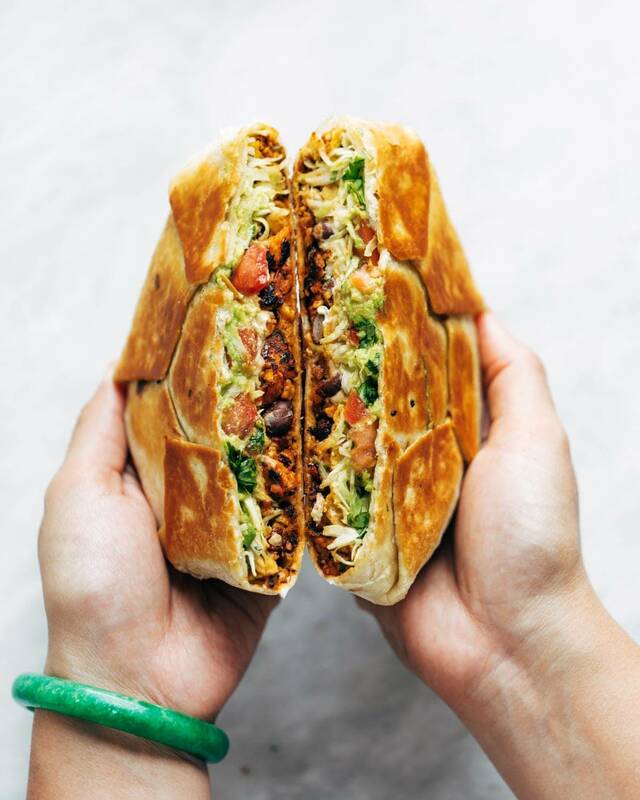 Lezz break this Vegan Crunchwrap Supreme into a five-step situation. First, put all your “base” stuff on the tortilla. In this case, we used sofritas tofu, beans, and cashew queso. But this would also be the time for rice, roasted cauliflower or sweet potato, any other meat or meat alternative, etc. Tostadas are easy and convenient. Doritos and Hot Cheetos are much more trashy and arguably more exciting. Now we do the fresh stuff – lettuce, tomato, jalapeno, marinated cabbage, cilantro, etc. I like the finish this layer with something sticky or creamy to help the top tortilla hold (for example, avocado). Place a smaller tortilla on top to avoid spillage. Get foldin. Basically you want to pull the edges in towards the center, one over the other. Hit up the skillet. Add a little oil or butter for good measure. Go for that crispy golden brown. And now crack it open and eat it. And no one will fault you for adding extra cashew queso over the top or, let’s be real, just straight up DUNKING it. I can’t even. These are so good. Please make them. Everyone deserves this kind of vegan crunchwrap love in their lives. 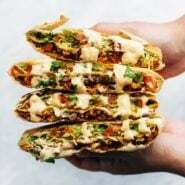 You can see the original beefy-cheesy-yummy Crunchwrap Supreme recipe here. 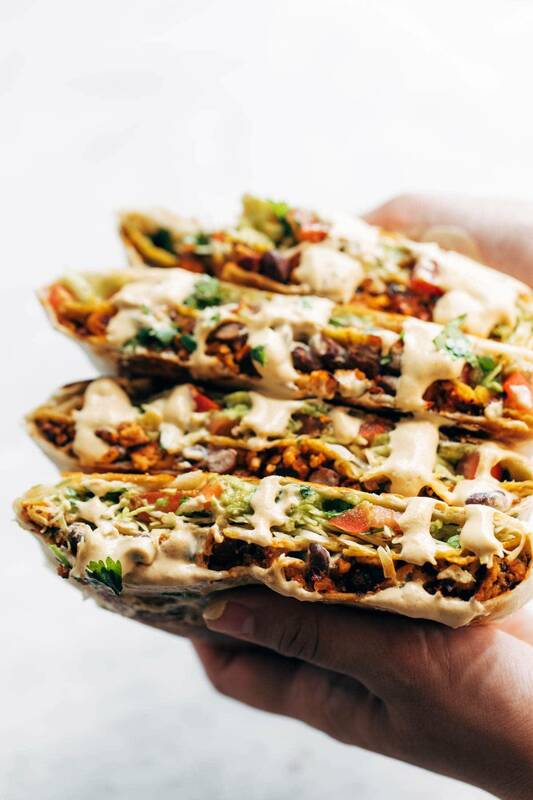 If you want a tofu-free version of a vegan crunchwrap, check out our friend Beth’s vegan crunchwrap recipe! Yield: enough filling for 4-6 crunchwraps! FOR MEGA CRUNCHWRAPS (this is what I demonstrated in the post): Cut a few of the large flour tortillas so they are the same size as your tostadas. Then, once you’ve layered all ingredients, just place a small flour cutout tortilla on top and fold edges over that. This should buy you a little extra space for filling. FOR MARINATED CABBAGE: I just tossed some thinly chopped cabbage with olive oil, salt, pepper, and vinegar to taste. It is really helpful blog to prepare Vegan Crunchwrap Supreme. Its very informative. This concept is a good way to enhance the knowledge and helpful to make new dishes. I like it and help me to develop very well. Thank you for this brief explanation and very nice information. Thanks for sharing. The information really amazing to read this is my first visit and please share this type of article it also provides information. Amazingly informative and helpful post. This sounds so tasty! I have never attempted cashew queso, but it sounds intriguing! Once you try cashew queso, a whole new dairy free world will open up 😉 Basic cashew cream will add creamy smoothness to just about anything. Try it in your favorite marinara sauce. Amazing! Totaly in love with this crunchwrap! Blew my mind! This is genius! I love the preparation method too, and how simple and wholesome all the ingredients are. Thank you for sharing! I have an allergy to cashews – can you use other nuts like almonds or pistachios? Hi Lindsay!! Your Vegan Crunchwrap Supreme is so creative!! Great work, and awesome photos as usual! It would be nice to give credit to those recipe creators who have previously done this recipe that you clearly drew on. With something as commonly shared on the internet as crunchwraps are, that’s like saying she should give credit for a taco recipe to the original developers. Besides, she has no responsibility to cite anyone else’s recipe unless it’s a direct copy of that recipe. Are you aware that if even one item is changed in a recipe, there is no responsibility to cite anyone? This recipe goes way beyond that; it’s clearly Lindsay’s own very unique take on the generic approach to crunchwraps. But you gave it ONE star, based on your mistaken interpretation of citation rules and without even trying the recipe? You nailed it, marsh! Yay Lindsay for a great sounding recipe. Why can't we all just be supportive!? I don’t often comment. In fact, I don’t often read the comments as I just enjoy reading the lovely blog content / recipes and I leave it at that, but for some reason I did read them today and the comment about credit really bugged me. Lindsay isn’t claiming to be the first ever person to replicate or adapt a Crunchwrap. In fact, she says herself that this recipe is an adaptation of one of her own earlier adaptations, made back in February, where she also acknowledges the original source as being Taco Bell inspired. A quick search of your website, David, would seem to show that you posted a Crunchwrap recipe back in March, so maybe you mistakenly feel you are owed some credit!? However, if we are following your standards, then I can’t see all of your acknowledgements for the multitude of recipes on Google that pre-date your version, some even as far back as 2015 (and that was just from a very quick search)! Rating this a 1 star was petty and unnecessary! There’s enough room on the Internet for everyone and all manner of recipes. Well said! And bravo for doing the research! David, she did it better (and easier) than you. Are you feeling inadequate because of that? If I had found David’s blog through something other than a sulky comment, I would have bookmarked it. I’ll keep giving my views to Pinch of Yum, not some butthurt guy who talks about how “manly” his food is. We can agree or disagree about the original comment, but I really can’t understand these attacks on someone’s character. Its not like this guy blatantly attacked the character of the creator – he asked for the recipe creator to give a shoutout if inspired by another post. Maybe it wasn’t done in the best way. But to follow up we say this person is “inadequate” … wrong for trying to promote more men to be vegan (I don’t understand how you can be against this). I think its pretty shameful how we treat people in comments and its pretty indicative of our current society. Where we just put people on blast instead of understanding where they come from. This guy likely feels upset that he spent hours making a post only to see someone else do it and get tons of recognition. But also probably should have done it in a more tactful way. But when we start attacking people directly and making fun of them… how are you any better? Bravo, Jamie. Let’s just all be kind to eachother! Ps: AMAZING recipe I am SO excited to try this tomorrow! We made these for lunch and they were delicious! Instead of cutting out small tortillas, we just ripped a large tortilla into quarters and it worked great! These look absolutely insane!!! YUM. Love how adaptable they can be too! Managed to achieve some food shopping today & stocked up on healthy foods. Grilled chicken, fruit juice, and going to try and get some Shrimp tomorrow and vegetables. I passed by the meatless foods section and might double back momentarily to see what other meatless items are available. This is a good idea to make a meatless Vegan wrap as I never thought of doing so and I no longer eat Taco Bell anymore. Omg that looks so frikin good! Wish I had that in front of me right now. Crunchwrap ay?…. very inspiring. Ooh baby baby! Look at those crunchwraps! Now I NEED to replicate those epic crunchwraps from Taco Bell! Yours look EVEN BETTER than the real deal. I want to try making these with whole wheat tortillas and blue corn tortilla chips! Hi, i love your cooking and photo so much. do you have facebook? I will try this for sure. And if I succeed I will be making this more than once! This looks so delicious! I will have to try it! I love this for the texture alone, but genius tweak with cashews and tofu to replicate the most unhealthy stuff, well done and thank you! As always, this recipe was so awesome, Lindsay! It had a really nice spice to it, and although I wasn’t sure how I’d feel about the vegan queso, it was delicious! I used the super simple pico de gallo recipe from your cauliflower burrito bowls. SO. GOOD. I can’t wait to try this vegan version! We made the first one you posted with beef and they were so ridiculously good. 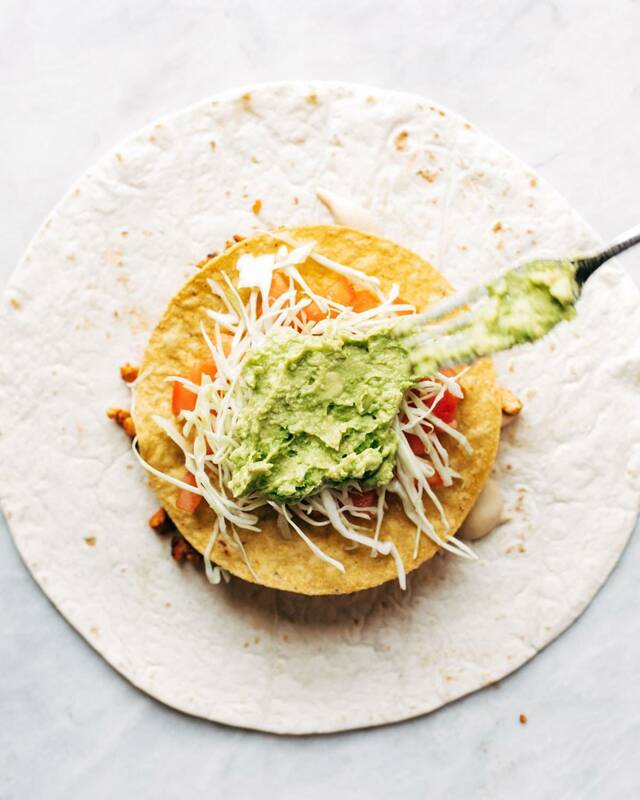 One tip, soft taco tortillas are the perfect size for the small tortilla on top of the tostada, and then you don’t have to waste extra large burrito tortillas. Then you can use any extra filling for more tacos, make chips, etc. This crunchwrap looks absolutely delicious! Thanks for sharing my kids definitely love it. I cannot even express my extreme love for these. I totally want those trashy cheetos in mine! And that tofu sofritos – YUM. I am now on team crunch wrap. Wow! These look and sound amazing! I am definitely going to have to try this recipe. So much healthier than Taco Bell too. Hope you enjoy it, Lora!